Over the years police have had a broad range of duties and responsibilities in addition to response for calls and provision of corporate services. Police agencies in Canada have both mandated and assumed responsibilities. Assumed responsibilities accrue from a variety of sources, including community expectations, the expansion of the police role due to downloading of tasks that are within the mandate of other agencies and organizations, and may also be a consequence of geography (e.g., the broad range of responsibilities of police officers in rural communities). Assumed responsibilities pose perhaps the greatest challenge for police agencies, as these are often a consequence of decisions and developments in the larger political and societal context. What are the current responsibilities of police services in Canada? How do policing responsibilities differ/converge across jurisdictions (e.g., provincial, municipal and federal police services)? How do policing responsibilities vary between police services of different sizes? To address the research questions, the study employed a multi-method approach involving review of the literature on the mandated and assumed responsibilities of police agencies and a survey of 27 municipal and provincial police agencies, First Nations communities, and individual RCMP northern detachments. A review was also conducted of the strategic plans and annual reports of the respective police agencies to determine the degree of alignment between these materials, the self-reported activities of the participating agencies and the mandated responsibilities of police agencies as set out in police acts. Mandated responsibilities include the tasks assigned to the police by legislation, including the RCMP Act and the various provincial/territorial police acts, and regulations and policies formulated by government. Assumed responsibilities are those that are a consequence of community expectations, the expansion of police activities, recommendations of task forces and commissions of inquiry, and the policies of individual police agencies as set out in strategic plans and documented in annual reports, among others. The specific demands that are made on police agencies are also influenced by the communities in which officers carry out their duties. The particular attributes of a given neighbourhood or community, including its socioeconomic features and the composition of its population, determine in large measure the types of incidents that occur there, the demands that are made on the police, the types of situations that arise, the relationships that develop between the police and the community, and the ability of the police to respond to the community’s needs (Griffiths, 2016). These differences may exist both between jurisdictions and within the same municipality. There is also considerable variation in the crime rates in rural communities across the northern regions of the provinces and territories. The responsibilities of the police are most pronounced in rural communities where the police are often the only permanent representative of the justice system and social services and support may not be readily available. The responsibilities of police officers in rural communities and, in particular, northern communities often extend far beyond those that are mandated. In addition to response for calls and provision of corporate services, all of the police agencies in the sample indicated that they provided administrative services. All extra-large, large, and medium size agencies and several smaller agencies identified a number of specialty teams within their organizations. In smaller agencies and detachments individual officers are assigned to some of these specialized functions. RCMP detachments north of the 60th parallel reported a variety of additional, and in most cases, unique responsibilities they assume to meet their communities’ needs in the absence of other service providers. All respondents reported involvement in a multitude of proactive activities, with coordinated, cooperative and integrated efforts an important focus for all respondents. All responding agencies and detachments indicated that they worked with Social Services, Education, and Health service providers. Extra-large and large agencies have the largest in-house capacity and capability, and therefore the greatest ability to provide initial response and investigation services for their communities. Their significant resources also permit these agencies and detachments to participate in multi-agency proactive activities with government and community organizations, and where required work with other service providers on integrated responses to specific crimes. They also provide members to multi-police agency investigative teams and are required to use specialized RCMP National Police Services. Medium and small agencies have initial response and investigation responsibilities, but by virtue of size, have fewer or no specialty teams and support services, and so may need to access specialized services from a larger agency, or for the RCMP, from other sections within the RCMP. They may participate in multi-police agency investigative teams and in multi-agency proactive activities and investigations, but to a lesser degree than extra-large and large size organizations. The small northern detachments also have initial response and investigation responsibilities, but have no specialty investigative and support teams. They reported relationships and cooperative efforts. They are required to provide support to local and territorial governments on an on-call basis, and must look to other RCMP detachments and Sections for support. dialogue on the limits of policing should be initiated. The study recognizes the importance of creating a robust program of police research that can inform police policy and operations. 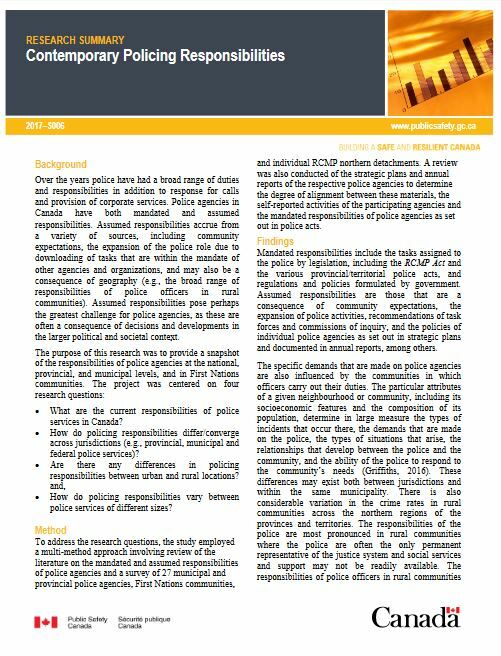 The findings of the study can be used to inform discussions of police policy as well as research on the competencies required for recruitment, education, and training. It can also contribute to the ongoing dialogue on the economics of policing and community safety. Griffiths, C.T. (2016). Canadian Police Work. 4th ed. Toronto: Nelson. Montgomery, Ruth and Griffiths, Curt Taylor (2017). Contemporary Policing Responsibilities, Research Report 2017-R006, Public Safety Canada.